Pond’s Age Miracle NIGHT Cream 50gm. Let your skin renew itself while you sleep. The Ponds age miracle overnight repair cream is a moisture-rich cream that works hard to repair damaged skin and promote cell renewal. Enriched with Intelligent pro-cell complex, CLA and collagen, this formula leaves you with smooth and soft skin that’ll feel up to 10 years younger. 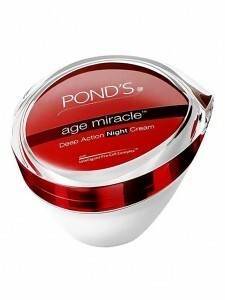 So, buy the Ponds age miracle overnight repair cream in this compact jar, right away. Imported from India.